Another Hurricane? Can we catch a break? While Houston, Texas and other parts of the Gulf are still reeling from the effects of Hurricane Harvey, another freak storm of epic proportions is bearing down on the Southeast. Hurricane Irma has now been increased to a Category 5, with winds capable of sustaining 185 miles per hour and gusts swirling up to 200 mph. Tropical Storm Jose is following behind Irma and could become a Category 2 hurricane by next week. This storm isn't expected to hit the U.S., but it could mean even more trouble for islands and countries based in the Caribbean -- ones that are now experiencing the wrath of Irma. Are you kidding me? Right now, it's hard to predict the path that Irma will take when it comes to Florida. It isn't whether the Sunshine State will get hit, but rather, how hard it will get hit. That's got Florida residents flocking to gas stations like it's the 1973 oil crisis, while home improvement retailers like Home Depot Inc. (HD - Get Report) and Lowe's (LOW - Get Report) , bulk goods stores like Costco Wholesale (COST - Get Report) and generator companies like Generac Holdings Inc. (GNRC - Get Report) all have climbing stock prices. And insurers? Irma's got them running for cover, too. 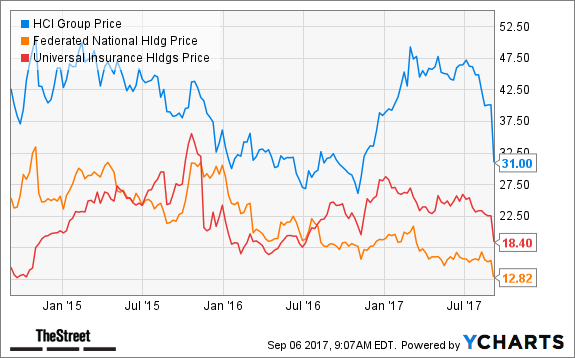 Universal Insurance (UVE - Get Report) tumbled 16.9%, Federated National (FNHC - Get Report) fell 15.3% and Heritage Insurance (HRTG - Get Report) dropped 14.2% on Tuesday in anticipation of Irma. Others, like HCI Group Inc. (HCI - Get Report) and United Insurance (UIHC also fell 14.7% and 9%, respectively. All but HCI are lower again on Wednesday. These bore the brunt of the decline as they have heavy exposure to Florida, but Travelers (TRV - Get Report) , Allstate Corp (ALL - Get Report) , Chubb Ltd. (CB - Get Report) and others fell hard, too, with these three stocks dropping 3%, 2.7% and ~2%, respectively. It wouldn't be a surprise to see the group slammed with losses, as Irma has only now started to hit the East Caribbean. Some forecasts says Irma may be worse than Katrina in terms of losses to insurers. Should Irma take a better-than-expected path, though, these current losses could be overblown.